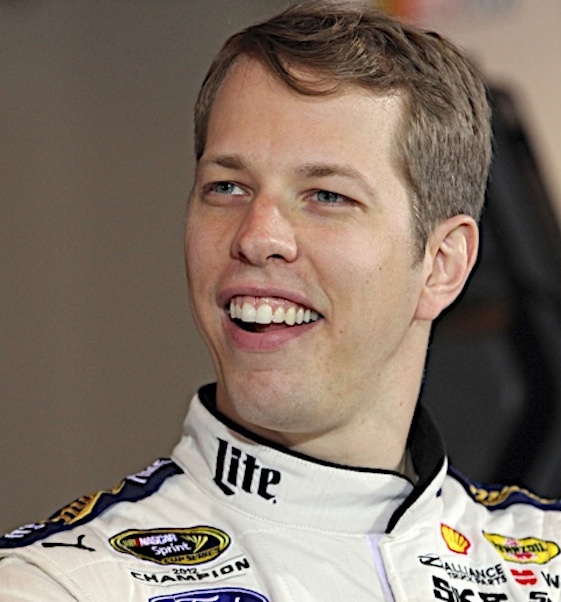 Chase driver Brad Keselowski won the pole for Sunday’s Sprint Cup race at Texas Motor Speedway on Friday evening. Keselowski won the pole and pick of pit stalls with a lap at 196.929 mph. Sharing the front row with the Team Penske driver was Chaser Kevin Harvick of Stewart-Haas Racing. The defending champion had a fast lap at 195.993 mph. Chasers Kyle Busch and Joey Logano were third and fourth respectively in qualifying. Keselowski was asked about the importance of the Texas race. (2) Brad Keselowski, Ford, 196.929 mph. (4) Kevin Harvick, Chevrolet, 195.993 mph. (18) Kyle Busch, Toyota, 195.716 mph. (22) Joey Logano, Ford, 195.419 mph. (42) Kyle Larson, Chevrolet, 195.341 mph. (20) Erik Jones(i), Toyota, 195.298 mph. (41) Kurt Busch, Chevrolet, 194.988 mph. (48) Jimmie Johnson, Chevrolet, 194.890 mph. (11) Denny Hamlin, Toyota, 194.665 mph. (88) Dale Earnhardt Jr., Chevrolet, 194.475 mph. (10) Danica Patrick, Chevrolet, 193.313 mph. (16) Greg Biffle, Ford, 190.402 mph. (19) Carl Edwards, Toyota, 195.341 mph. (15) Clint Bowyer, Toyota, 195.327 mph. (55) David Ragan, Toyota, 195.178 mph. (5) Kasey Kahne, Chevrolet, 195.143 mph. (13) Casey Mears, Chevrolet, 194.819 mph. (24) Jeff Gordon, Chevrolet, 194.637 mph. (31) Ryan Newman, Chevrolet, 194.560 mph. (27) Paul Menard, Chevrolet, 194.175 mph. (33) Brian Scott(i), Chevrolet, 194.175 mph. (14) Tony Stewart, Chevrolet, 194.112 mph. (78) Martin Truex Jr., Chevrolet, 194.000 mph. (43) Aric Almirola, Ford, 193.666 mph. (21) Ryan Blaney(i), Ford, 195.525 mph. (3) Austin Dillon, Chevrolet, 195.496 mph. (1) Jamie McMurray, Chevrolet, 195.334 mph. (17) Ricky Stenhouse Jr., Ford, 195.157 mph. (6) Trevor Bayne, Ford, 195.143 mph. (47) AJ Allmendinger, Chevrolet, 194.735 mph. (7) Alex Bowman, Chevrolet, 194.644 mph. (9) Sam Hornish Jr., Ford, 194.623 mph. (95) Michael McDowell, Ford, 193.472 mph. (26) JJ Yeley(i), Toyota, 192.940 mph. (34) Brett Moffitt #, Ford, 192.651 mph. (40) Landon Cassill(i), Chevrolet, 192.445 mph. (32) Joey Gase(i), Ford, 190.617 mph. (62) Reed Sorenson, Toyota, 187.865 mph.